As diplomatic tensions mount between Canada and Saudi Arabia—with the Canadian ambassador expelled from Riyadh this week over comments made by the Foreign Affairs Minister criticising the Middle Eastern kingdom’s human-rights record—a more successful example of cultural exchange between the two countries stands in Vancouver's Vanier Park. 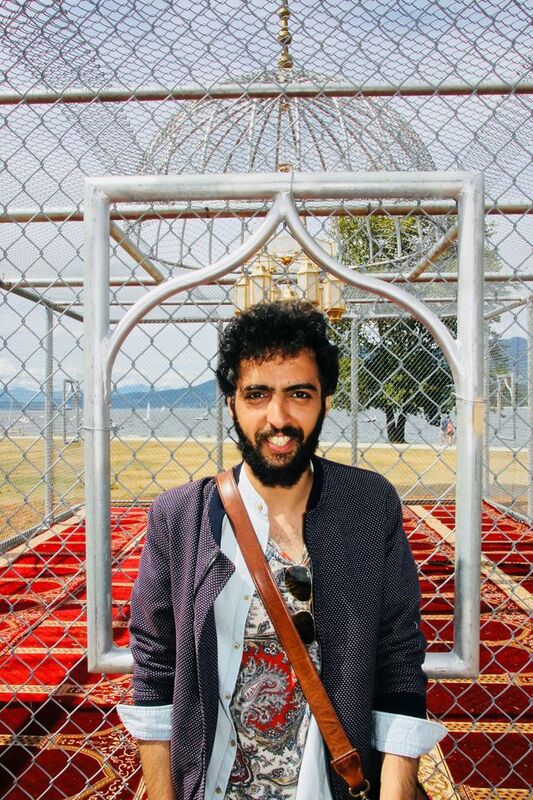 The Saudi artist Ajlan Gharem’s installation Paradise Has Many Gates, a replica of a mosque made of chain link and steel pipe, opened the fourth edition of the Vancouver Biennale, with the aim of serving as a meeting ground for different communities. 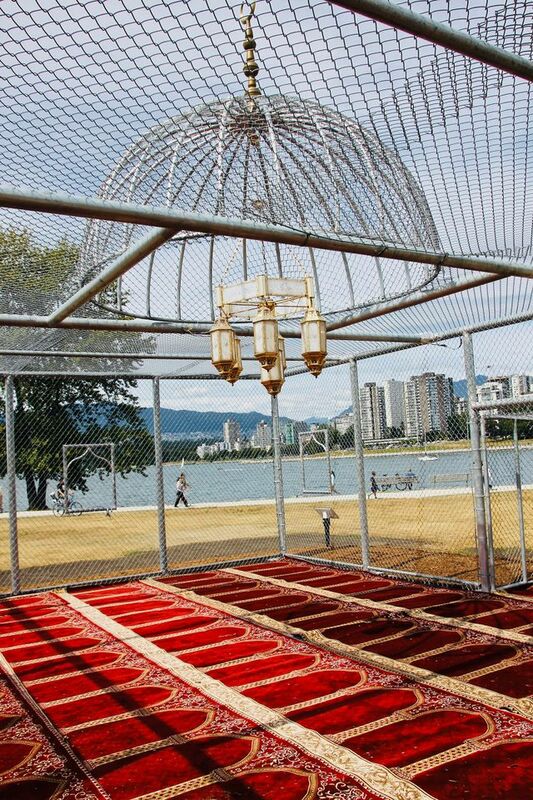 The mosque is due to remain in Vancouver long-term, however the first iteration of the work, installed in the Arabian Desert in 2015, was only up for 24 hours before it was dismantled for fear of reprisal from Saudia Arabia’s powerful clerics. That was long enough for the 33-year-old Riyadh-based artist (and younger brother of Abdulnasser Gharem), to create a video with locals and foreign workers that alludes to tensions between the sacred and the secular, the rural and the urban. 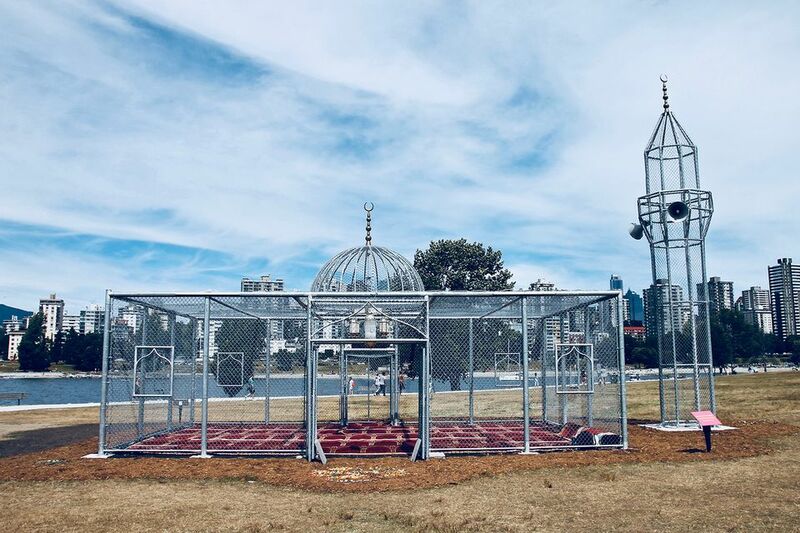 While the 2015 video of the mosque referred explicitly to Guantanamo Bay, with men wearing orange jumpsuits, Gharem had “children in cages” in mind when installing the piece in Vancouver, he said during an interview in July, before the recent diplomatic issues broke out. And as well as responding to both Islamophobia and extremism with his work, Gharem added that he hoped it would be a gathering place for different communities. On the afternoon we interviewed the artist, the installation attracted a wide range of visitors, ranging from a Jewish woman who chatted amiably with Gharem while photographing the mosque's steel mesh minaret, to young children playing, and a locally based Yemeni photographer. “A few years ago, it would have been too dangerous for me to do this kind of work, but things have changed,” Gharem said, citing the sheer demographic power of Saudi Arabia’s youth—50% of the population is under the age of 30, according to a recent government survey—and the explosion of social media. “At first Sheikh Muhammad Munajid condemned my work online,” he explained, referring to the hard line cleric who called for a fatwa against Mickey Mouse in 2008. When Saudi tweeters explained the conceptual aspects, the cleric withdrew his comments, Gharem said. He also attributed the changes to the recently installed Crown Prince Mohammed bin Salman, who has instituted a number of reforms in Saudi Arabia. But as the deputy prime minister and minister of defence, the Crown Prince is also behind the country's aggressive foreign policy. Gharem would not comment on the current situation, but the biennial's founder and president Barrie Mowatt says that "the current tensions naturally will/have/can become a part of the work's story". Mowatt adds that Gharem's installation "is representative of how a work's intention and meaning can change with its location and the politics of the time", and is in keeping with the exhibition's mandate of "art as a catalyst for dialogue" and "community engagement and learning". Other works in the biennale, include the Chilean artist Alfredo Jaar’s digital billboard A Logo For America (1987/2018), and a takeover of the historic Patricia Hotel by the Melbourne-based artist Patricia Piccinini’s surreal sculptures. Around the edges of Gharem's work are mandalas made of native rocks and plants by the Indo-Canadian artist Sheniz Janmohamed. Soon, where bright red Saudi carpets are now spread on the grass, some of the First Nations artists who chanted welcome songs at the installation’s opening in June—each one taking a turn standing at the mihrab, the prayer niche closest to Mecca—will display their weaving. During the day, the installations offers framed views of the surrounding Pacific vista; at night, it becomes a jewel-like steel lantern.